He has no past. And he may have no future. His memory is blank. He only knows that he was flushed out of the Mediterranean Sea, his body riddled with bullets. There are a few clues. A frame of microfilm surgically implanted beneath the flesh of his hip. Evidence that plastic surgery has altered his face. Strange things that he says in his delirium -- maybe code words. 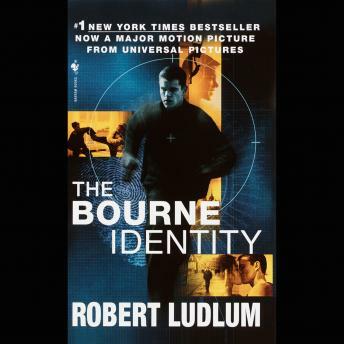 Initial: "J.B." And a number on the film negative that leads to a Swiss bank account, a fortune of four million dollars, and, at last, a name: Jason Bourne. But now he is marked for death, caught in a maddening puzzle, racing for survival through the deep layers of his buried past into a bizarre world of murderous conspirators -- led by Carlos, the world's most dangerous assassin. And no one can help Jason Bourne but the woman who once wanted to escape him. Not that impressed with the story, but the biggest problem is that the sound quality is poor. Narration keeps dropping volume to the point you can't hear the read. Amazing! Super interesting listen and the narrator was perfect. I did not like the narrator. He seemed to try and fit as many words into one treath as he could making very difficult to understand the story. His tone and style made, what I understand to be a good book, sound like a cheap detective story from the 50's.